Issue 48 of Inside Crochet goes on sale today and my oh my are there some wonderful projects inside! Ali Cambell's gorgeous sweater is on my (ever growing) list of things I'd love to make for myself, one day, Helda Panagary's sweet flower bracelets are perfect for using up scraps and will make great little christmas gifts. Having recently ventured into experimenting with beads in crochet, I'm drawn to Heidi McCarthy's beautiful shawl, which incidentally is her first ever published pattern. I also loved Emma Escott of Lulu Loves, first column and sweet flower embellished journal cover. I have 2 patterns in this issue, rather excitingly is the first instalment of my mystery blanket. I've been wanting to design a blanket pattern for ages. My problem being I'm generally very good at starting blankets but not quite so good at finishing them (if you saw my pile of unfinished blankets...) so I decided I needed a much more engaging way to create and actually finish a blanket. This design therefore uses a different stitch repeat for each colour stripe, giving you opportunity to really stretch those crochet muscles, worked from the centre out, starting as a mandala and growing into a square, meaning you can finish whenever you feel you've reached the size you want. Part 1 is the mandala, which can be made as a standalone piece in it's own right if you don't fancy taking the next step. The rest of the blanket will be spread out over the next 3 issues. 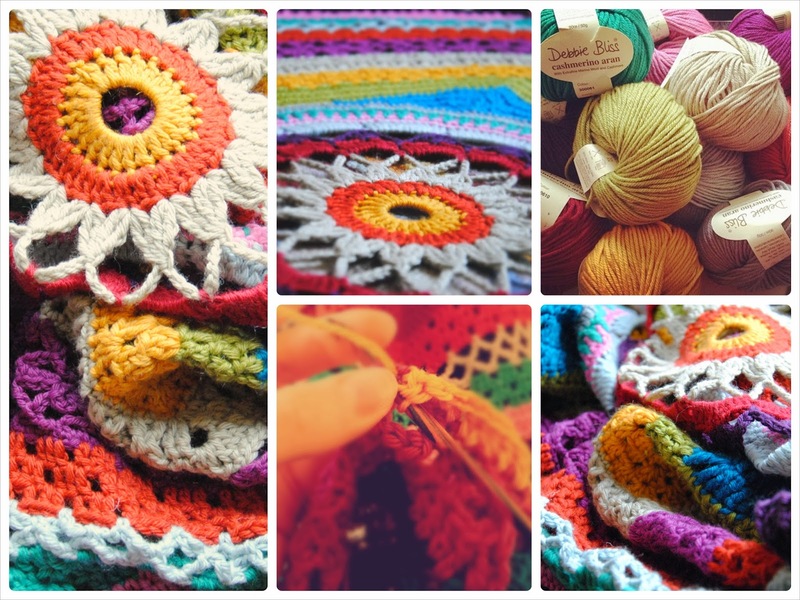 If you do take part in this series I would love to see how your blanket progresses. 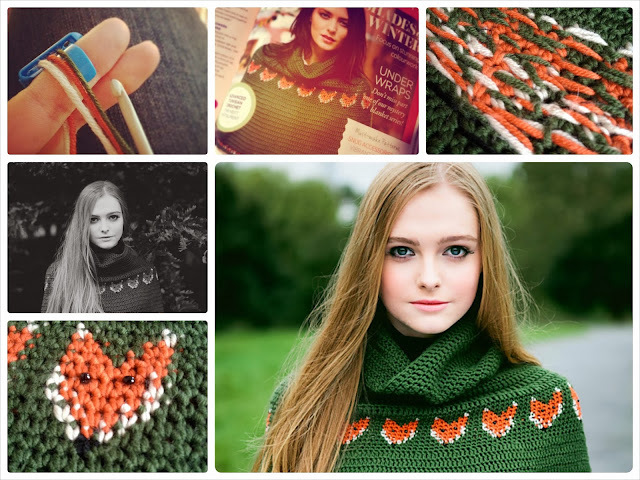 The second pattern is my Foxy Cape, I will not lie, I adore this pattern, I think it's possibly my favourite one to date and I'm so pleased to already have the sample back in my hands, well snuggly perched on my shoulders as I type in fact. Worked in the round, bottom up, this is a very simple piece, worked mostly in treble stitches, with a few rounds of double crochet on the bottom and double crochet used for the foxes. The trickiest bit is the colourwork, there are times when you are using 3 yarns at once, as long as you keep all the balls apart and work in a methodical way, you should be able to avoid getting in a tangle. There will be quite a lot of switching between colours and obviously this is time consuming, however there are only at total of 12 rounds of colourwork across the whole piece and the rest I promise is very quick. I purchased a yarn guide, which I found extremely helpful, it took a bit of getting used to, but once I got my tension sorted it was a breeze to use and helped speed up the process. If you're tempted by any of the patterns inside, you can find the magazine in newsagents from today, plus I've got a copy to giveaway to one lucky reader, just pop a comment on the bottom of this post and I'll draw a winner on Monday. 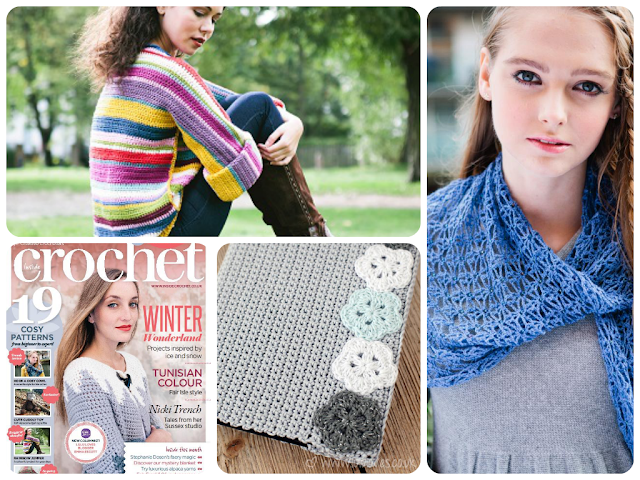 Inside Crochet 48 is out in the UK today or can be purchased digitally here. Photos that aren't by myself are by the wonderfully talented Britt Spring.